BookIT can be installed on a 3 gang switch box (example: Garvin Industries® MGSB-3) using the BTX-BOOKITWM (sold separately). Loosen the two bottom mounting screws but do not remove them completely. Remove the included mounting bracket and discard or save for future use. 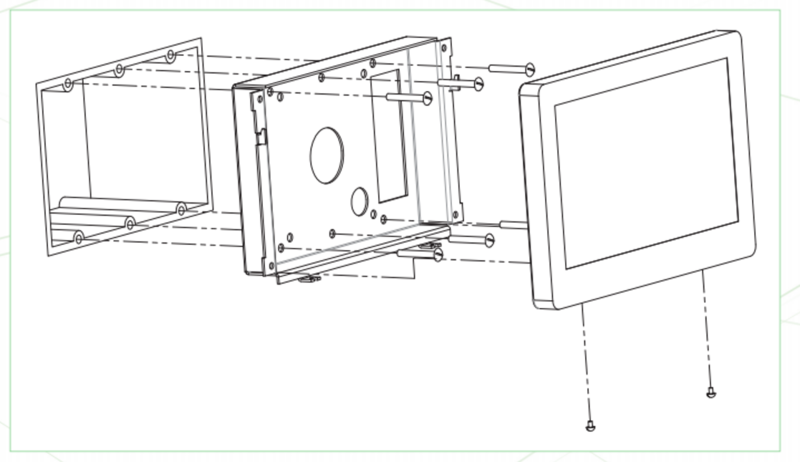 Place the BTX-BOOKITWM against the pre-installed 3 gang switch box so that the mounting holes align. 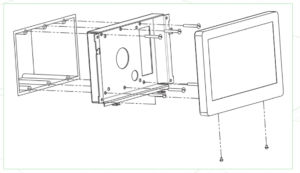 Install six 6-32 screws included with the BTX-BOOKITWM and tighten until the bracket is secure. Plug the network cable into the BookIT display, if not using WiFi. Also plug in the power adapter if PoE is not available. Hang unit on the mounted bracket. Secure the bottom mounting screws.